SANIBEL, Fla. (October 23, 2018) – In March, the Clinic for the Rehabilitation of Wildlife (CROW) received a grant for $17,843 from the Florida Sea Turtle Grants Program, which is funded by the sales of the sea turtle specialty license plate. CROW received the grant to support a sea turtle recovery tank, which will benefit Florida sea turtles. The newly designed fiberglass tank, which is currently being installed, also features an improved filtration system. CROW was chosen for the award through a competitive application process that is open to coastal county governments, educational institutions and Florida-based nonprofit groups striving to improve the livelihood of sea turtles and conserve Florida habitats. Launched in 1996, the "Helping Sea Turtles Survive" specialty license plate raises money for two important programs that benefit Florida sea turtles—the Florida Wildlife Conservation Commission's Marine Turtle Protection Program and the Sea Turtle Grants Program, which distributes money back to the local level for turtle conservation projects. The sea turtle plate is currently the number two overall selling specialty tag in Florida – second only to the University of Florida specialty plate, making it the number one environmental specialty plate. "It's rewarding to know that so many people share our concern for Florida's sea turtles," said David Godfrey, Sea Turtle Conservancy Executive Director. "What we do in this state has a dramatic impact on sea turtle populations around the world. 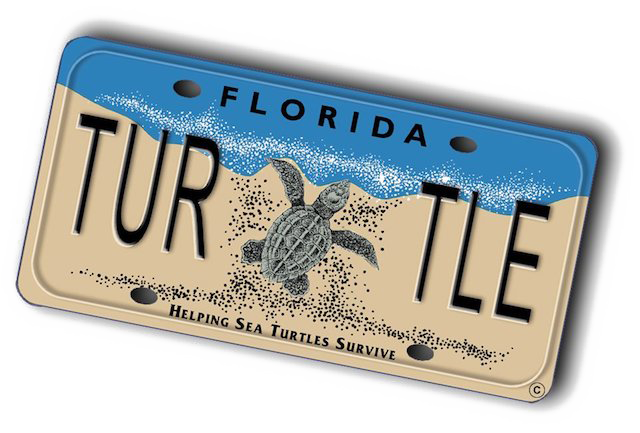 By purchasing the sea turtle specialty plate, Floridians are voluntarily funding important programs to save these amazing creatures." A new sea turtle rehabilitation tank and filtration system is currently being installed at CROW.